Take a quick look at Tru with a screenshot-driven journey of how to get started with photo & video organize. It’s dead easy! Tru is designed to be the easiest photo & video organizer ever. Without doing fancy things, Tru does 1-click organization of your photos & videos into a universally understood folder structure. Tell Tru where your photos and videos are - you can even select a parent folder and Tru will pick up all photos and videos from all folder and sub-folders under it. 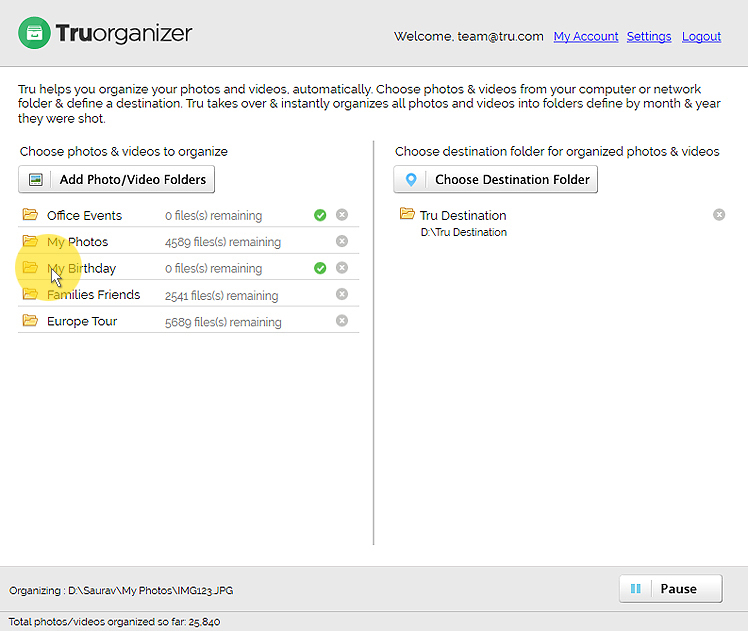 Tell Tru where to put all your neatly organized photos & videos - simply select a folder as your destination folder. Tru does the rest, automatically and continuously. Tru gathers photos and videos from all your sources, extracts meta data from them and uses it to organize them in a simple “Month Year” folder structure - easiest to understand & use. Tru is free to start and comes with all the features. Once you use it to organize some of your photos and videos, you can unlock the Premium version and stay organized, automatically.